It's worth the trip up north for an 2011 CTS Epic Ride Destination, this is an excellent place for a long weekend . Haliburton Forest has a trail system of over 100 km of single-track and over 300 km of trails in total on a 50,000 acre property. There are trails for everyone and every level of skill. There are great cardio trails , lots of rocks and roots, plenty of short, steep uphills and all completely rideable. We can camp on the premises and ride all day (and night if we want!). I hear that the lakes there are awesome to swim in at the end of a long ride! 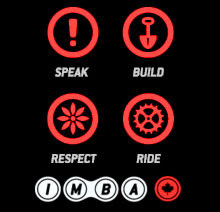 The MTB season runs from Victoria Day to the weekend after Thanksgiving. Let me know what you think, please leave a comment. Ok, this is my first post for you guys so please, give some feedback on what you find informative so that I can tailor my following posts to be appropriate and helpful. Now with that out of the way....here it goes! You know that feeling you get after a big spahgetti dinner or carb filled meal? The feeling that you want to sleep for a couple of days? 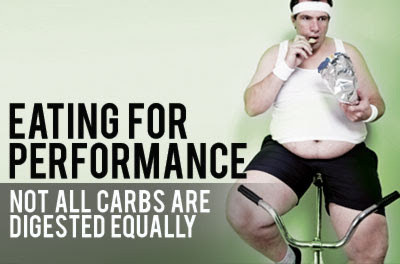 Well, this is where we can start to begin separating the good carbohydrates from the bad. When you consume any quickly digested carb (high on the "glycemic index"), you get a spike in energy, but it's quick and is followed by a huge drop in energy. Foods that do this commonly come from enriched wheat flour foods (highly processed) IE. white rice, white bread and of course high sugar content foods (chocolate, pop etc). Therefore, these types of foods would be items to stay away from before a long trip out in Copeland Forest or prior to any exercise that requires you to be working out longer than 15 min. On the reverse side of the G.I. (Glycemic Index) we have more natural and less refined foods that take longer to digest and, in turn have a slow release of energy to draw off. They require more energy to burn too! Items that fall into this category of carbs are whole grain bread, oats, and long grain rice. Not only do these foods, that are high on the glycemic index, digest quickly and cause a feeling of drowsiness and only yeild a quick and short energy burst, but...they also are the culprit of unnecessary weight gain! If your body doesn't require the food immediately, it will be stored as fat!! When the body can use the food for a long period of time (Low on the G.I.) it can process little bits at a time, and will be less likely to contribute to the "hibernation insulation". With that being said, before you head to the trails think twice about what you're ingesting a few hours prior. It can make or break you out there! The CTS bike club goes to JoyRide 150 Feb. 12 2011 To surprise fallow member Phil for his 40th birthday. Man I hope my 40th is at JoyRide as well. This past weekend at Joyride fellow CTS member "Big Daddy Mack" pointed out, while I was riding around on the crown that my front suspension was now just a fork minus the suspension. At first we tried to add some positive and negative pressure, and that helped a bit, but we both came to the conclusion that it might be time for a rebuild. Mountain bike suspension forks or shocks can wear out and will need to be changed, especially when you have a gorilla riding around on them. The rugged nature of mountain biking terrain makes the shocks one of the more important components on a bike. They should serve to absorb the impact of various obstacles that a mountain biker might encounter along the trail. Since this feature has been removed from my RockShox Reba suspension forks I'm hoping I can rebuild them. I will have a follow up post to let you know how it goes. How to clean your mountain bike. Riding countless kilometres through mud and dirt, it's no surprise that your mountain bike isn't the cleanest thing in your garage. Your mountain bike doesn't need to sparkle, it's just going to get dirty the next time out anyway, but a regular cleaning can prevent problems down the road. Dirty Job: Someone call Mike Rowe, cleaning your bike is a messy job! Don't even think about wearing your CTS jersey, or any shirt you don't want covered in grime. Putting on a shop apron and rubber gloves is a good idea. Also, Cleaning it inside in not the best idea just ask my wife. Place it where black grease won't look out of place. Supplies: Make sure you have the appropriate supplies. Park Tool recommends the following materials: Bicycle cleaning brush, Repair stand, Chain scrubber, Degreasing solvent, Chain lubricant, Rags and sponges, Two buckets, Biodegradable dishwashing liquid and Water hose. Both buckets should be filled with hot water as warmer temperatures will clean the bike better. Dishwashing liquid should be mixed into one of these buckets. As you clean your bike more often, you'll be able to decide which items you can't live without. Tip: Don't have a repair stand? Don't worry! Just lay your bike against a wall, hang the seat over a thick tree branch or use a bike rack to suspend it in the air. 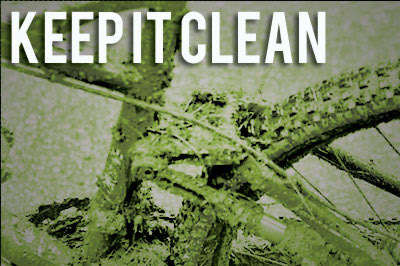 Scrub: Clumps of mud, leaves, sand and other grime should be wiped clean from your bike after every ride. If left on it can destroy drivetrains, brake-pads and shifting. Plus it's heavy, and if you're like me, you need to shed every possible pound before hitin' the trail. After all the trail souvenirs are removed, wipe the whole rig down with soapy water and apply degreaser to the drivetrain. Removing the wheels will allow you to clean areas that are typically unseen. Brushes, rags and sponges should be used to get rid of mud and other grit. Don't neglect your chain and rear cassette. a toothbrush works well for this. Just remember to gently scrub your bike down. You don't want to damage your paint job or take off your CTS sticker! Then rinse it down with a hose. Tip: A high pressure water hoses are NOT safe to spray your bike with. Use a garden hose on a gentle setting and don't spray water into the bearings. Lube it up: Once your bike is dry, your chain, cables, levers, shifters, derailleur pulleys, and pivot points need to be lubricated. Make sure you wipe off any excess lube after application. Tip: Remove both pedals and seat post, then apply grease where metal meets metal.